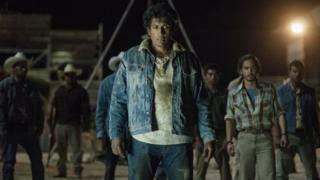 Netflix has reassured fans of its popular crime drama Narcos that the show’s future remains safe. Doubts were raised after security concerns escalated when a location production scout for the series was shot dead in Mexico last year. But producer Eric Newman said “no one will threaten the future of Narcos”. “We’re going to be just fine,” he said, adding that the series was moving on to “an incredibly exciting season… its best one yet”. Mr Newman was speaking to BBC News in Singapore during an overseas press tour. Narcos began as a gritty drama about the rise and fall of Colombian drug lords and gangs such as Pablo Escobar and the Cali Cartel. The storyline will now shift to Mexico and will explore the origins of the country’s modern drugs war by going back to its roots. Responding to the death of 37-year-old location scout Carlos Muñoz Portal, Mr Newman described the incident as an “unbelievable tragedy”. “It was a death not related to drug trafficking or the show. It occurred at the very start, we had not even begun filming yet,” he said. 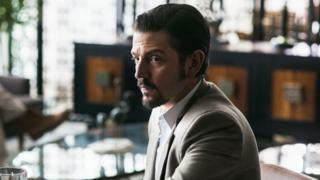 Actor Diego Luna, who portrays convicted Mexican drug lord Félix Gallardo, said there was a “tremendous amount” of security in place throughout the course of filming. He added that he was “not affected at all”.